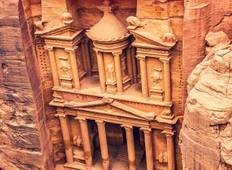 Find a Discovery trip that explores Middle East. There are 614 tours to choose from, that range in length from 3 days up to 39 days. The most popular month for these tours is September, which has the most tour departures. "Abraham Tours exceeded my expectations. This 12 day tour, Israel, West Bank and Jordan..."
"A good 10 day trip from Tel Aviv with Abraham. There were a few transportation snafus..."
"Sam was amazing, he made the experiance 10 times better"
"From the planning stages and well into execution, Beyond the Nile Tours is beyond..."